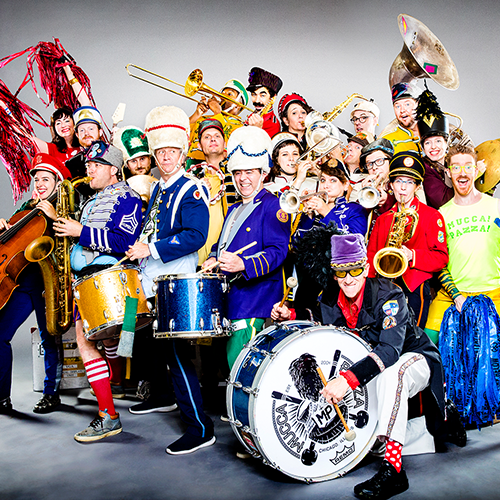 Mucca Pazza is an intrepid interdisciplinary instrumental music ensemble from Chicago, IL. Since 2004, they have made a name for themselves playing alarmingly danceable music composed and arranged especially for their implausible instrumentation by band members - original music which defies classification but has bloomed out of manifold influences, from surf to Stravinsky, from Bartok to Zappa, from Esquivel to Ellington. In addition to blaring trumpets, slithering saxophones, clarinets, trombones, and tubas, the band boasts a drumline that seems to share a single nervous system, an entire section of disparate instruments that don’t belong anywhere near a marching band (electric guitars, accordion, violin, and yes, a cello), and contains within its multitudes a cheer squad that performs absurdist cheers and asymmetrical, impressively low-to-the-ground pyramids. No-one has ever been completely certain of the exact number of people in Mucca Pazza. Everyone can be completely certain that this group of weirdos belongs together! Mucca Pazza: embracing the absurd! in solidarity with the improbable!